SUSSEX skipper Ed Joyce was dismissed for 83 in the last over before tea to give Somerset a lift on the first day of their crucial Championship match at Hove. Having removed Luke Wells (13) and Matt Machan (21) before lunch, Somerset enjoyed further success in the afternoon. 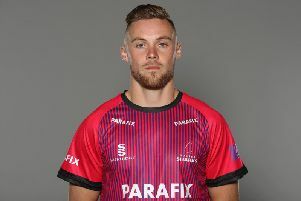 Peter Trego had Chris Nash caught off the glove for 11 with a ball which spat off a length and Luke Wright (20) was taken low down at second slip by Somerset skipper Marcus Trescothick, his third catch of the innings so far, off Jim Allenby. Joyce had batted serenely, hitting 14 fours in 143 balls faced before he was caught behind down the leg side off Jamie Overton, leaving his side 162 for 5 at tea having won the toss. It was Overton’s second wicket of the day. Earlier, he had Machan (21) caught in the covers by his brother Craig while Wells edged to second slip in Tim Groenwald’s first over.